Following the Tone Hammer 500 amplifier, the 350 retains the sound of its predecessor within a smaller footprint. The Peavey Headliner is a new rack-mountable bass amplifier head with matching enclosures in the Peavey Tour Series in a 10 lb. package. Carvin announces the MB210, their newest entry in their Micro Bass amp lineup. Carvin has expanded its Micro Bass lineup with the new 115MB extension cabinet. The latest evolution of the Peavey TNT 115 and TKO 115 amps are now available from Peavey dealers. 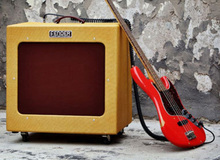 The new Fender Bronco 40 bass amplifier provides 24 presets of amps and built-in effects. Gallien Krueger introduced at Summer NAMM the latest model in its MB series, the MB800. Overtōn announces at Summer NAMM new products for bass players, including the Flyweight 200 and 500 amp heads, and three bass speakers.